Jason and Graeme embark on another great days outing: Calculus Crack. 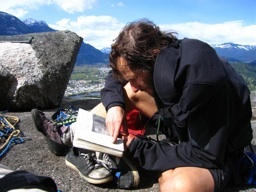 Jason met Graeme by bike at the base of the Squamish Chief's Apron and climbed the 5.8 crack. I am possitive this route has NEVER been climbed before! Just kidding, but possibly the FRSA (First Recorded SPOC Ascent). See 'Squamish Select' or the Squamish Climbing Guide for route info.